It was our second humanitarian mission to Mathare Valley, Nairobi, teaching about Marriage and Family to leaders of Missions of Hope International. 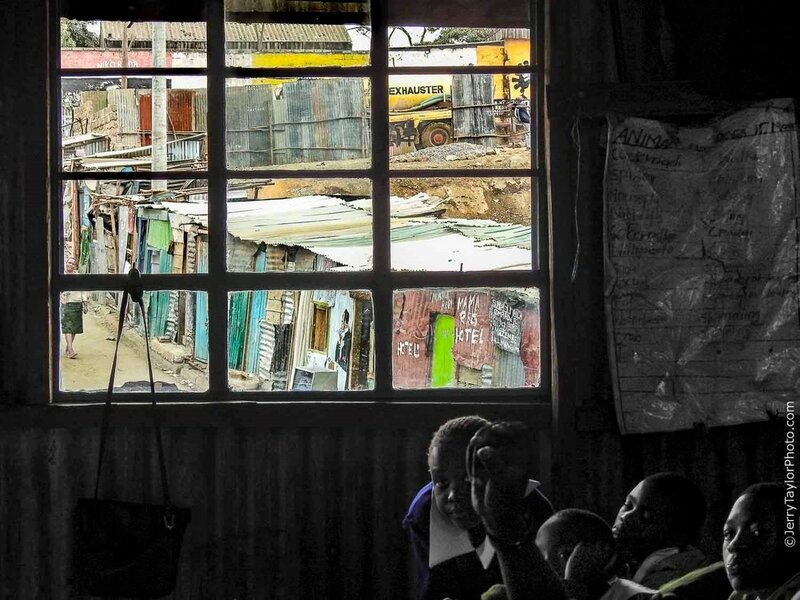 Nearly a million people live in the Mathare slum alone, an area of less than one square mile. The school has exploded from a humble beginning of fifty students in one location to now over 12,000 students and 20 schools. You can visit the school websites here and here. Or, YouTube video about the Valley, of which there are many. During our month, we visited all the schools and heard the stories of leaders, students, and families. We are in the Bondeni school; the room was stuffy and hot. The corrugated sheet metal walls vibrate noise and radiate the heat from outside. I was in shorts. The teacher is asking questions and in this image, you can see a hand is raised in front of the girl with the blue top. At first, I thought, “Ah, a hand in the way. It just ruined the photo.” but, it is part of the whole action going on in the class room. I am the distraction. There are a couple of pair of eyes looking at me; a couple of eyes looking away. Information is posted on the right-hand side of the image about the class rules. Outside there is a “Exhauster” truck for collecting and carrying human excreta; the truck is a rare sight. There are very, very few lavatory facilities in Mathare Valley. Sewage runs in most streets. The tin-roofed shacks are a mixture of homes, “Hotels,” and other businesses. A “Hotel” is really a place to eat and not to stay; the menu is usually rice and beans. The brilliant colors are everywhere. The image in the lower center pane of the window is a figure of a man who symbolizes a barber works here. The bare footed woman on the left is typical of no foot ware and her smile is characteristic of most people you meet in the valley. People adapt and live their lives; hopefully, some of the children in this image will escape the Valley.